The mole cricket is a very dangerous pest of vegetable crops. If you do not take measures to combat these insects, they can completely destroy the crop, Podgrusha the roots of the plants and damaging the roots. The mole cricket is a large insect with a length of 40-50 mm, dark brown color with a hard shell and tough leathery cropped wings. His head is also covered with armour, equipped with powerful jaws and tentacles. The front legs of mole crickets resemble the claws of cancer. It is these legs of the mole cricket bursts from many hundreds of meters of soil, as his place of permanent habitation – the upper layers of the soil where the insect digs tunnels. Most harmful of vegetable planting bring larvae mole crickets, because during their growth they are extremely voracious. Female lays eggs in may-early June in a special socket under the ground. 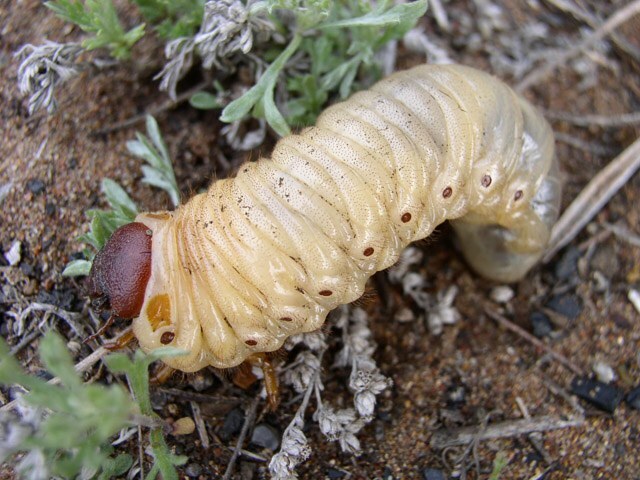 Two weeks later, the larvae are already very active, emerge from the nest and begin digging their own tunnels in search of food. Laying eggs is stretched in time, so young individuals appear throughout the season, until autumn. With the onset of cold weather, mole crickets hiding in the winter burrows to a depth of 1.5 meters. In other cases, the pest prefers warm compost heap. These gardeners use compost creating traps and scattering them upon the occurrence of severe frosts. In this case, the pest dies because it no longer has the opportunity to find shelter. To deal with the hungry larvae mole crickets is difficult because they come in large numbers and can destroy a crop in a matter of days. To avoid this, you need to deal with pests regularly and systematically, conducting preventive measures. Distribution of mole crickets can be avoided if carefully treated garden plot, preventive measures include deep digging of the soil, systematically loosening between rows to a depth of not less than 10 cm and regular removal of weeds. These pests love to hide in moist and warm shelters. These include manure and compost heaps, piles of debris and grass. You need to remove from the site all debris, so as not to give the pest possible to dwell nearby crops. If you have the opportunity, in early June can be scattered on the garden beds special traps – wet humus with fresh manure. For convenience, the manure can be spread on pieces of cardboard or plywood. Every day we need to bypass the trap, lift the leaves and collect hiding larvae. It is believed that the smell of some plants do not like the mole cricket and it avoids areas where they are planted. Such plants include marigolds. In addition to the popular industrial methods there are drugs to combat the mole cricket, such as Meditox". You need to use it strictly according to instructions to avoid unwanted consequences. It is best to use all these ways of dealing with mole cricket comprehensively, only in this case it is hoped that the pest will leave the plot and leave the planting alone.